If I ever met cancer in real life, I'd kick her in the balls. The multi-faced tumor is a deadly and heart-braking wee beastie, and any moves that can be taken to stay one step ahead should be considered essential, regardless of where on the planet you live. 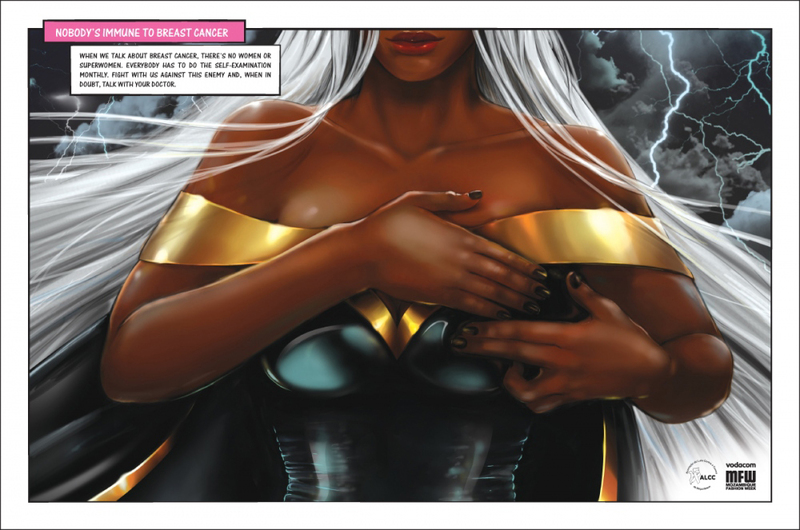 In Mozambique, the Associação da Luta Contra o Cancer (ALCC) has reached out to audiences, with a series of public service announcements, using four of the best dynamic duo's in comics. Wonder Woman, She-Hulk, Storm and Catwoman, all visually protecting their life's against that villain that even a super-punch or a solid gold bustier can't stop. While it's a fair bet we won't see posters of Captain America, Flash, Wolverine, Superman and Green Lantern performing the male equivalent, these posters by advertising powerhouse DDB (and artist Maísa Chaves), do a great job of showing if earth's mightiest do the monthly touch'n'check, be you male or female, so should you. love em but shouldn't Power Girl have one too? Great series. Mom's a survivor so I'm glad to see the Comic world showing its support. Thanks guys! This post took in over 1,000 views in one day - so I think plenty of people share your views Craig! Dave - you know I thought Power Girl was the White Elephant in the room too - but I guess they ran with the more known icons. Still, I'm glad She-Hulk is in - she is definitely under-rated in how iconic she is for the House of Ideas. Susan Storm, Elektra, and Supergirl would've been other great choices. Still as the number one story on Ads of the World (one of my favourite sites for my graphic designer day-job inspiration) I wouldn't be surprised if the series is expanded on! Those ADs are real attention grabbers. Great idea and great post! Cheers for the great feedback Don, and welcome to IADW! Those advertising folk sure made a hit with this campaign! It's such a good thing. Anything to raise awareness about this horrible disease. Thanks guys, I'm glad it was a hit with you all as well. Robert, I deffinitly think male testing is something that needs just as much promotion, how you render that without falling into any one of a number of pitfalls would be a challegenge even for Ross I reckon!